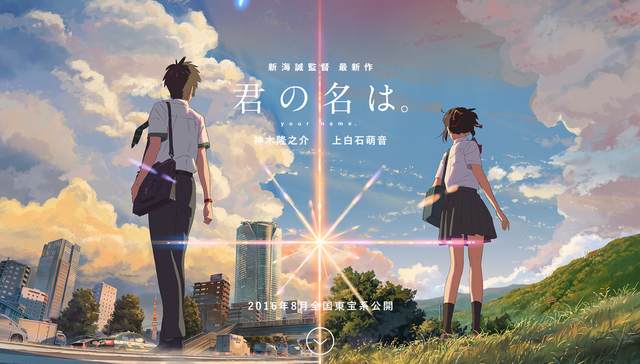 If there’s any certainty in the anime industry, it’s that any work by Makoto Shinkai will have dazzling visuals accompanied by a solid soundtrack. Ever since I first listened to Voices of a Distant Star, I enjoyed Tenmon’s short, sweet music. That appreciation reached a high point with 5 cm/sec, which featured the famous “One More Time, One More Chance” melody and insert song that captured love over long gaps of time and space really nicely. His subsequent work for Garden of Words did not feature Tenmon, but KASHIWA Daisuke did a stellar job on the score as well. Talk about an energetic soft rock track! With the guitars going off in the background, the whole tone of RADWIMPS’ music reminds me of something you’d get out of all the soft rock groups they used in Honey and Clover, which makes me wonder if this anime will also turn into a coming-of-age anime. RADWIMPS do pretty much all of the music for Kimi no Na wa. Based on the trailer, I can say that Shinkai’s got a lot of solid collaborators in the music department and this work will be no exception. The band’s leader, Yojiro Noda, had met Shinkai two years ago and subsequently became involved with this film early on. That said, RADWIMPS has made quite a name for themselves. Two of their singles, “Order Made” and “Dada” managed to hit number one on Oricon’s single charts. They are pretty popular in Japan, and even if I’ve not heard of them, their stuff is pretty eclectic. At least, if this video is of any indication because the Kimi na wa trailer was much more conservative. It’s pleasant though! Fans of RADWIMPS should totally link me to your favorite works via YouTube. Mostly as a way for me to get up to speed on who they are and what they do. The Eminence Symphony Orchestra, based out in Australia and known for performing music to video games and anime have announced that they will be performing in Japan on August 14, 2010. The concert, titled “Passion: Twilight Legacy” will include such pieces as the Otakon 2010 theme song and possibly a few tracks from the Project Promise disc containing arrangements of music from Makoto Shinkai’s works. For those who are not able to attend, there are options on the table to have the concert streamed. More information can be found on the concert website.